Parenting a newborn is hard enough without the anxiety of all that unnecessary plastic waste adding to the burden. 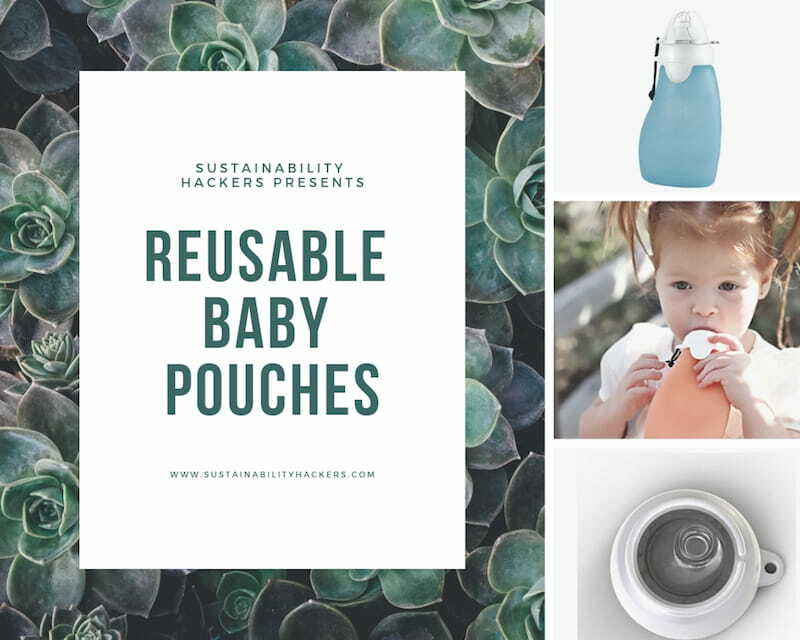 Let’s look at some of the easier ways to replace single-use plastic as you welcome a baby into your life – modern cloth nappies, sustainable wet wipes, food pouches and toy minimalism will be explored. Before I start, I’ll come clean and let you know that much as I tried, I certainly wasn’t the master of all things sustainable in the early days, months or years of parenting. I think your top priorities when you start parenting should be yourself, your kid(s), your health, and your relationships. If washing cloth nappies is too much hard work, but you really want to be as eco a parent as you can, then you can be gentle on yourself and let yourself get your sustainability brownie points through other options, like choosing nappies and wipes that are biodegradable. Hopefully these eight plastic-free suggestions and a few tips may make it all a bit easier! I know, wouldn’t it be great if your babies just loved and ate everything you made? I saw those parents, with their incredibly well-behaved children eating carrots, apples and cut up grapes for lunch … or even steamed broccoli. Meanwhile, pretty much all my babes would eat when I introduced solid food was those apparently delicious packs of baby food in the little plastic pouches that Rafferty’s Garden, Heinz and other companies sell. Delicious and convenient … so easy to slurp from the little packs when on the go, right? But with all that plastic waste being an environmental nightmare, there has to be a better way – and here is one! How about putting your own homemade delicious mashed up steamed vegies, or custard, etc. into reusable food pouches? I’ve successfully tried out the Sinchies brand, but some of the other ones – especially the silicon ones – look baby-friendly, strong and easy to clean. Commercial baby wipes made from non-biodegradable plastic are fabulous for cleaning just about anything, aren’t they? Well here are a few options to make your love affair with baby wipes a bit more sustainable: a) make your own wipes, b) use biodegradable wipes and c) use reusable, washable wipes. I recently got around to trying out the homemade wipes recipe that has taken the parenting internet by storm. A practical and resourceful mum posted this hugely popular video showing how she made her own baby wipes. You’ll have to watch the video to learn the method, but I’ve written out what I think are the main ingredient quantities to save you time. Carefully cut the towels with a bread knife before putting them into the plastic container(s). For each half of the roll: whisk boiling water, coconut oil and body wash together. Then pour mixture over the wipes. Carefully pull out the cardboard roll from the centre. Verdict: these clean babies bottoms better than any wipes I’ve used and I’ve seen no rashes on my kids. I’d say they are 100 % worth the effort. I think they can be a little bit scratchy on super-sensitive areas so just use your discretion. Another suggestion: using Viva paper towels for baby wipes opened my eyes to the properties of these awesome paper towels. So I now use them to wipe fingers and hands of my young girls using just tap water to carefully wipe faces and hands. I have also been using wet tissues as wipes where suitable although they fragment more easily than the paper towels. Ready to break the plastic wipes habit, but don’t have time to make your own wipes using the method above? The good news is that it is now possible to buy some that are 100% compostable! Naty brand is organic certified and are 100% compostable. That makes me happy. I’ve tried them and they work a treat for my kids and I. These wipes were at least two times more expensive than plastic-based baby wipes last I checked, but the peace of mind knowing that they won’t take 100 years to break down is worth it, if you can afford them. One little note: If you are worried about carbon emissions of transporting your baby products, it’s worth noting that all of the disposable wipes and nappies I have looked at are all made overseas, so it’s not necessarily something to base your choice of best options on. Out of interest though, here’s my back-of-the-envelope calculations for Naty wipes coming from Turkey to Australia: the carbon dioxide emissions are at least 0.15 g for every g transported, at 10 g per tonne of freight per km of travel over 14,900 km (I based this on the distance as the crow flies between Istanbul and Sydney, and only included shipping, not other transport segments, so in reality it’s likely to be substantially more). Emissions are therefore part of the pollution picture to be considered too. I was gifted a set of Apikali reusable wipes and I got a fair bit of use out of these back when I lived in an apartment with an easy-access laundry. Prepare, use, soak, wash, start again. Since moving to our new house, where the laundry is downstairs and there’s not much room for buckets for soaking/storing, the wipes have sat peacefully in their storage bag and not been touched. So I think (as I mention with nappies below) that you need a well set-up laundry to make reusables good for yourself as well as the planet. On another note, my reusable wipes even came with adorable wetbags for taking wipes on-the-go. I will admit I never actually used the wetbags for wipes or nappies, but I have since re-appropriated these washable, spill-proof bags as snack bags and keep-cup bags, earning myself a few sustainability brownie points. Nappies can be a major source of work and waste during parenting. Here are a few ways to make your nappy use more sustainable. A few things to help you choose your best options are a) how much time you have, b) how well your laundry is set up (for reusable nappies and/or wipes) and c) what your budget is, as that will determine whether you can afford the more biodegradable disposable nappy products (that I estimate are about twice the price of their home brand plastic competitors). Soon after I had my first child, I excitedly went online and bought several sets of cloth nappies from some of the best sources around. And sometimes I even used them. My hat goes off to the parents who have kept their babies in cloth nappies, such as one friend I had who managed to always dress bub in reusable nappies whenever I saw her, and who just generally seemed incredibly organised and fashionable. I have no idea what her secret was except that she was clearly very organised. 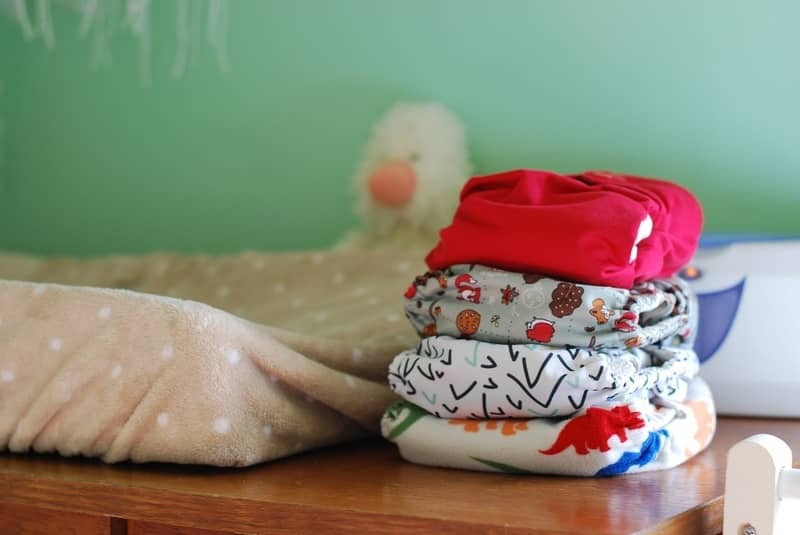 Reusable nappies are great for reducing plastic pollution and this can be great for the environment (so long as you consider how you launder them and minimise the need to dry them in a fossil-fuel-powered clothes drier). However, I think there might be a few tricks to the trade. How big is your laundry and how well set up for nappies is it? You need a bucket for dirty nappies, dirty wipes (if you use reusable ones) in addition to your other soaking bucket(s) for kids clothes, etc. Our laundry is now under the house, accessible from the garden. This makes washing clothes and/or nappies a chore (especially with two little helpers who want to follow me wherever I go). So alas, my reusable nappies now reside in a pillowcase, waiting for me to donate them to someone with more skills/time. That being said, my youngest is almost out of nappies, so at least I will soon be able to say I no longer need my reusable nappies. Being someone with a lower back that sometimes gets sore from poor use, I wonder if a top-loading washing machine might be better than a front-loader for reusable nappy washing. If I had such a one, I wouldn’t always have to bend down and throw things into the washing machine. Just a suggestion as something to think about. Solar panels and a drier? Seriously, who has time to hang the things? Kudos to those who persist! But now we have our solar panels on our roof that could power a drier renewably, I kind of wish we had a clothes drier and I’d be showing those nappies who is boss. For more ideas and tips, see sites like the Australian cloth nappy doctor. Choice magazine’s review of nappy options also outlines how to “dry pail” which is a way to take some of the hard work out of reusable nappy laundering. Swedish company Naty also makes nappies that are organic certified, made in Turkey. According to the Naty website their nappies are made from corn-based film and contain predominantly natural and renewable material. I tried out a pack from Woolworths and I thought they were pretty good. A little bit scratchier and not quite as water tight as the Coles/Woolworths home brand plastic ones (but the plastic ones can take hundreds of years to break down!!). 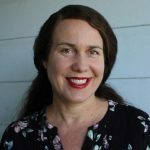 An Australian company, EcoOriginals (made in China) also sells relatively sustainable nappies, and they are available online to be shipped to your door. While their nappies do contain plastics such as polypropylene and lycra, they are more landfill-friendly than typical disposables, with 80% of the nappy being plant based, and the packaging also being compostable. I don’t like buying plastic toys as presents (nor toys of any material really) that kids (or adults!) don’t really need! With this in mind, I recently told my family that I was going to start giving my nieces cash for their birthdays and Christmas, not presents. To my surprise, my sister was totally fine with this and she then put the money I gave my nieces towards a compostable system with plants/soil/compost combined called Composta. She really got them a present in the reduce-reuse-regenerate spirit I had intended! I’ve also let my family know that I really don’t expect presents from them for my kids. By all means we love presents, but I also love it when my family choose less not more stuff for my kids’ presents. It’s hard to avoid plastic toys when they are so appealing and educational. But to reduce my plastic toy purchases, I try to apply a less is more approach. So while we certainly do have plenty of plastic toys in our house, I generally try not to buy many plastic toys at all – and a lot of the ones we do have are hand-me-downs from my nieces. 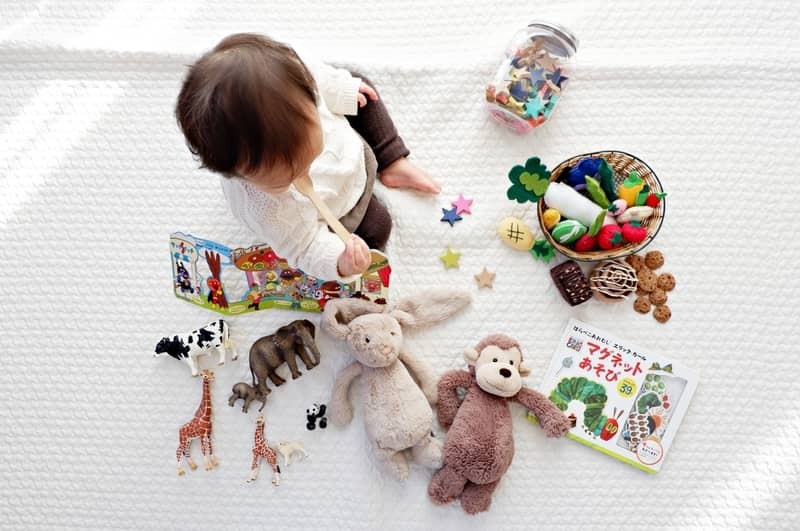 I want to keep working on minimising the toys we have in our house, as a recent study suggested that de-cluttering and reducing kids toys really aids their play. My kids do still get quite a few presents from friends and family, but I’ve seen a pleasing consideration from family in how they choose (or don’t choose) to get my kids’ toys since I let them know I was happy with fewer presents. Another way to avoid/minimise buying plastic toys is to consider a toy library or to source toys via buy-swap-sell sites on Facebook, etc. It’s worth keeping an eye out for more sustainable toy options, such as wooden blocks, paper books, miscellaneous craft supplies made from paper/cardboard. It’s great to hear that Lego is now making some pieces out of plant-based materials. Though this has its own issues (because land used to make materials for toys is land that can’t be used to feed the people of the world), it’s a step in the right direction for them to be innovating this way. So how’d you go in the baby phase? 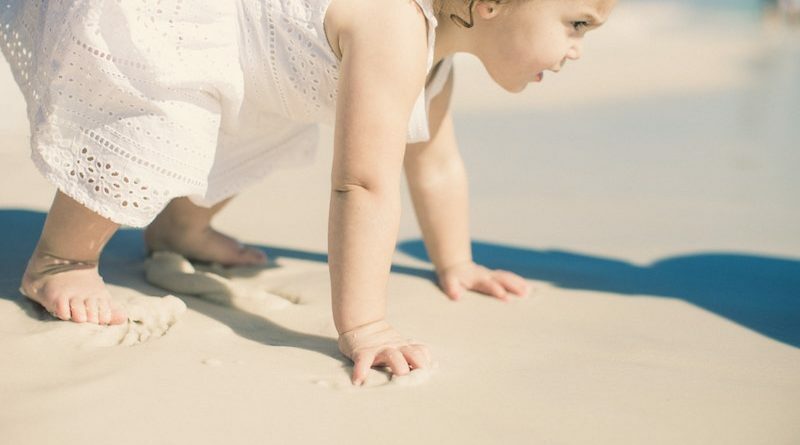 If, like me, you didn’t do especially well … you might be pleased to think of some of the ways you can get your sustainability feel-good vibes with your kids when they are toddlers, preschoolers and kindy kids! Here’s a good place to start: reduce the use of plastic straws! Heard of some of the great plastic reduction campaigns, such as the Last Straw Australia? Well my kids love their Reusable silicone straws from Biome. I recommend silicone as I think it is safer for kids (and this is what I use for my kids) rather than metal or bamboo because it is soft/bendy and won’t jab them in the mouth. Just a note: with the two-piece design silicone straws, we just use the bottom part of each straw as a shorter straw, as I have found the point of connection lets some air in. Another way to avoid plastic straws is to use paper straws. I’ve found packs of paper straws (much more biodegradable than plastic!) at reject and party supply shops. Shopping for a family means quite a lot of groceries!! I suggest keeping a kit ready to use on the go with 10 or so reusable shopping bags neatly packed away. Don’t forget see-through produce bags for your fruit and vegies. You can use these to buy produce, store it in the fridge, and see through the bag to see what vegies you have ready to cook with in your fridge! As a parent you need to look after yourself as well as your kids! Cups of coffee or soy chai tea can nourish my spirit. So don’t forget some of the sustainability hacks that apply to kid-free adults can also work for you! Keep-cups are a great way to reduce coffee-cup rubbish going to landfill. My suggestion is that you get a cup-sized wetbag to store your keep-cup(s) in to keep it clean when clean, and to keep it from making a mess in your pram/handbag when dirty. 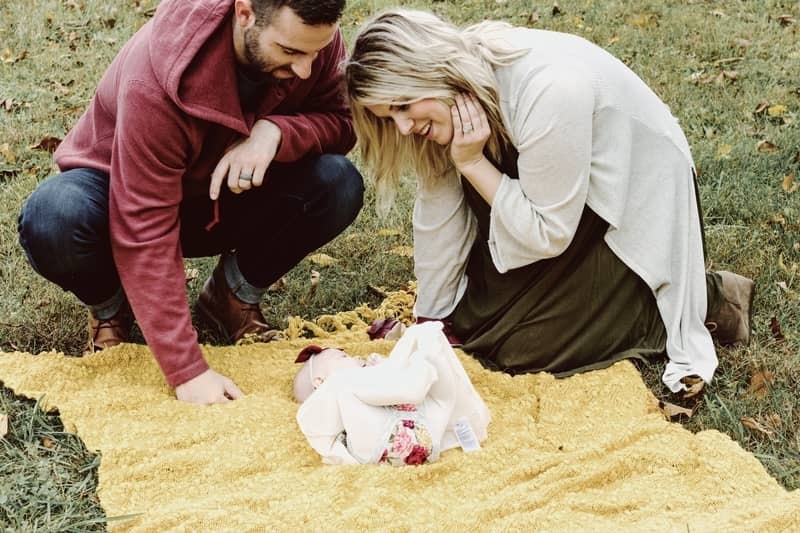 While reducing the use of plastic and other resources throughout your early days as a new parent is important, I think it’s important to remember that getting your sustainability hacks working for you is a life-long learning process. It can be tricky finding the time as a new parent to research which baby products are most sustainable and will also work for you. It took a while for me to get into the sustainability groove with kids in tow. But now I easily find the time daily to take the vegie scraps to the compost, while I water the plants and run a load of washing, and the kids play in the garden. Meanwhile my kids are learning about compost, and recycling, and how plants grow while we work and play. With my little ones getting older, it’s easier to find time to research sustainable baby/kid products in more depth! So be gentle on yourself, do what you can, choose the options that work for you and make you happy. Share your successes and concerns with your friends or via online groups. I wish you well in your journey raising your eco kids to be as eco and happy as they can be.